The recent spate of dog killings and a fire at an animal shelter, which caused protests from animal rights activists, have drawn attention to the acute problem of stray animals in the city. As winter approaches, thousands of stray dogs and cats are on the streets, facing death from freezing or hunger. And although concerned citizens often feed them and try to help in other ways, chances of finding a home for a stray animal are often slim. A group of unidentified “dog hunters” has killed dozens of dogs in several Moscow neighbourhoods over the last couple of months. What especially enraged animal rights activists was the recent poisoning of several dogs that lived on the territory of the Moscow State University and were fed by the staff. Although the dog hunters have anonymously claimed on an Internet forum that they only targeted stray dogs, in September more than 40 pet dogs were poisoned when taken for walks by their owners in 50 Let Oktyabrya park in southwest Moscow, media reports said. Dozens of Muscovites showed up for a rally against dog hunters, staged on Novopushkinsky Square in late October. But just days after the rally, a fire broke out at the Alma stray dog shelter in eastern Moscow, killing about a dozen cats and dogs. Although the police said the fire was caused by carelessness, the shelter’s owners insist it was arson. There are between 30,000 and 50,000 stray dogs on Moscow’s streets, Alexander Tkachev-Kuzmin, chairman of the Russian Veterinarian Association, told The Moscow News, adding that another 15,000 are kept in large municipal shelters. Other estimations put the number of strays even higher. Statistics for private shelters and temporary homes for abandoned animals are not readily available, but experts say the figures are small compared with the total number of stray dogs in the city. Until the early 2000s, city authorities’ policy was to catch and kill stray dogs. In 2001, a new regulation was adopted, under which stray dogs were supposed to be caught, neutered and then released. In 2007-2008, large municipal dog shelters were built in all of Moscow’s administrative districts except for the central district, and now stray dogs are supposed to be caught, neutered and then kept in shelters for the rest of their lives, unless someone wants to adopt them. However, due to the shelters’ limited capacity, the policy isn’t properly observed. More than 1 million dogs are kept in Moscow homes, of which about 10,000 end up in the street every year. 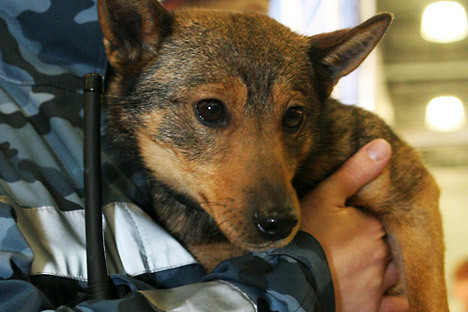 Yulya, a coordinator for Ovchar-Komanda, or Shepherd-Team (nokomanda.mirbb.com), a group of volunteers that tries to find new homes for abandoned shepherd-breed dogs, told The Moscow News that many pet owners don’t understand the responsibility of having a dog in their home, which could lead to abandoning them. “People who take a dog should realise that it’s not a toy and that they are facing responsibility for it,” she said, adding that some people just don’t think in advance that owning a dog would entail a substantial investment of time and money, and end up just throwing their pet onto the street. Ovchar-Komanda accepts information about abandoned shepherd dogs and verifies the pedigree by photographs. If the dog appears to be a shepherd rather than a mongrel that just looks like one, team members take it to a so called “perederzhka” – a temporary dog shelter run by a private individual, mostly outside city limits. Conditions for placing a dog in a shelter of that kind may vary, but the average fee is about 6,000 roubles per dog per month – a sum covered by volunteer donations. For the first month, the team members try to locate the dog’s owner – in case it was lost rather than abandoned – and only after that they begin to look for a new home, using mostly online resources. Yulya added that some dogs found by Ovchar-Komanda have to wait for a new home for months, but the timeframe normally depends upon the dog’s age and temper, the younger and kinder ones getting adopted quicker. The rate at which dogs are taken could vary, according to Yulya. “For instance, over the first 10 days of November, we picked up five dogs,” she said. Private animal shelters run by volunteers are often secretive about their whereabouts to avoid situations in which irresponsible pet owners would just dump their unwanted cats and dogs there. She said 30 puppies had been dumped at a shelter over 10 days following one media report about it, causing an epidemic. Stray cats might appear to be in a slightly better position than dogs, because people more willingly take an abandoned cat that is smaller, looks less threatening and costs less money to keep than a dog. Meanwhile, under existing regulations, abandoning a pet isn’t a punishable crime. “There is no law punishing owners for abandoning their pets,” Tkachev-Kuzmin said, adding that in the existing situation even if there even were a law of that kind, it would be unlikely to be enacted. “If all dogs had chips, they would be easily found and brought back to their owners,” he commented. “There is no point in just taking stray dogs off the streets as more dogs will come from Moscow region to take their place,” he added.